St. Jarlath's not a common name in the list of Catholic Churches in the United States. Was it Irish? Sure, said Father Scahill, St. Jarlath was a contemporary of St. Patrick, patron saint of Ireland. St. Patrick consecrated to St. Jarlath as a bishop without diocese, but the Lord gave to St. Jarlath a sign and a prophecy through St. Benin: "Ahi where the wheel of your carriage will break found a Diocese " and it did. The broken wheel was the symbol of St. Jarlath (which is why if you look at the front of our church on the right side is the figure of our saint with a broken wheel. Tuam Diocese was founded by St. Jarlath in the village of Connaught, Ireland. Since then this Diocese was recognized as one of the most Catholic in the Christian community. The Rev. Patrick McHugh, a native of the diocese founded by our saint, saw the first lights of his life in the year 1872. He studied for the priesthood at the Seminary of All Saints in Dublin formed as a missionary. Was ordained a priest on June 5, 1898. In 1901, he was sent to his first mission to the United States of America, to the parish of Our Lady Star of the Sea in the Archdiocese of San Francisco California. In 1910 he was transferred to the parish of San Antonio in the city of Oakland where he served as vicar under the direction of Ilustísimo Father PC York his friend and adviser. That same year he was appointed pastor of a parish where there was no parish house or land, his first Mass jurisdiction in the fire station that was in the Champion Street near Hopkins Street. In March 1910, Father McHugh, bought land on the corner of Fruitvale and Montana, where he began to build what would be his first parish. The land had a house, the father immediately began building a church with a room in the back of the building, the house became the rectory, all at a cost of $ 17,750.00 dollars with an additional charge of $ 1,500.00 Dollars, Furniture. The new parish got up, Dimond District. of 1910 held its first Mass on Christmas Eve at 12:00 pm, Christmas 1910.
by Archbishop Patrick W. Riordan. Contra Costa County, south of Avenue 28, Avenue 55 east and west on Lake Merritt. The community grew and grew and Father McHugh decided to open a branch (mission) at the corner of High Street and Allendale Avenue, was a small wooden church where the father used to say Mass on Saturdays. In 1916 this small mission became Parish of St. Lawrence O'Toole, under the direction of Father John Lally as its first pastor. In the first 20 years, Father McHugh led his flock as God intended, however, he dreamed of having a school to educate the children of his parishioners and others, it was not until 1930, when that dream became true, actually. Father McHugh, was convinced that a parish without a school is only half a parish. The parish comes to fulfill Jesus' command to preach and teach the Gospel through the Parish School. E.J. Hanna, solemnly blessed the school and the Convent San Jarlarth entrusted to the Sisters. St. Joseph of Carondolet, dedicated to Catholic education, as educators and administrators of the school. In 1849, Moses Chase, Horace W. Carpentier and associates bought agricultural land and established a town they named Clinton and later was renamed in honor of Brooklyn to the city where Mr. Carpentier was born native New York. In 1852, this same Mr. bought land west of Oakland by naming it for the abundance of oaks and rangeland that was in place. In 1854, Oakland is named as county seat and Mr. Carpentier was named its first mayor. With this beginning, the first ferry service to San Francisco, took place on May 17, 1854. The same year, Mr. Carpentier, makes the village council approved an order for sale of the waterfront. Thereby making a large profit, which infuriated all citizens who ousted him from office and was replaced by Charles Campbell in March 1855. In 1880, were 24.182 inhabitants in 1890 rose to 42.863 inhabitants. In 1900 65.611 people were surveyed. By 1910 already had joined all the small towns of Lynn, Clinton, Brooklyn and Fruitvale, forming the principles of our present city of Oakland with a thriving industry that allowed growth which had 150.174 inhabitants predominantly composed of different races the Irish, German, Portuguese, Italian and Chinese. Returning to the story of St. Jarlath we can say that before 1910 there were two Catholic parishes in what is now known as East Oakland, the first was consecrated in 1871 and is known as the Parish of San Antonio highly Irish origin, in 1892 The Franciscan friars were installed in the Fruitvale area by establishing a convent and the parish of St. Elizabeth of Hungary Parish engaging as National German community's attention. Years pass and the city grows the memories of days that are past crowd into our minds to remember the Dimond District with its streets and avenues as McArthur and Fruitvale where horses and carts came and went along the road . And what about the trolley to affectionately called him the "Dinkey" because he had to be pulled by horses, the changes were faster after the earthquake of 1906. Homes and businesses were taking up space that used to fields and crops. The pastor of St. Jarlath was riding across the county to visit his flock and from his Pastoral Office, imparted the sacraments and blessings, ministering to their parishioners as their pastoral needs require it. Over the years, the parish along with their aged pastor. The First and Second World War passed into history. In early 1951, Father McHugh was seventy-nine years of which fifty and three were dedicated to his priestly life and was tired. It was time to take a break on their long walk. The Diocese was granted the title of Pastor Emeritus and his loyal and good-natured friend the Rev. Henry L. Plukett, as a director with full authority over the parish. Father Plunkett was an Irishman with a great sense of humor, currently almost forgotten in the memories of the church, its recorded history begins in San Francisco where he served as Coadjutor in Mission Dolores. By the time he was assigned to St. Jarlath, the coming of the parish of Santa Rosa in Crockett where he was pastor. His stay was short but left a profound mark on the life of St. Jarlath since instructed the firm Ryan & Lee draft what would become the new parish of St. Jarlath. In early 1952, Father Plunkett was transferred to the Parish of San Isidro in Danville as pastor where he served until his death on April 28, 1958. On February 28, 1952, architect Paul Ryan of Ryan & Lee firm wrote to the new administrator of St. Jarlath "Father Thomas Scahill congratulations on his new assignment at St. Jarlath Parish inform you that the father asked me Plunkett report that is exactly what was done to the planned construction of the church and rectory. In March of that year, Father Scahill approved and recommended some changes such as the organ, the statues, stations of the cross, stained glass and ornamentation. The final cost of the church and rectory was $ 633,538.00 dollars, apart from the cost of furnishing the two buildings, now, 2012, the cost would be $ 8,000,000.00 dollars. It is noteworthy that the New Organ built by the Austin Organ Company of Hartford Connecticut, according to John E. Klobucer organist of the parish was one of the best bodies at the time. 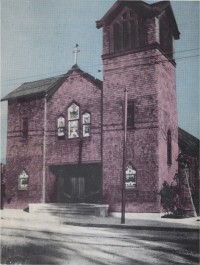 The September 12, 1954, the new parish of St. Jarlath was dedicated by then-Auxiliary Bishop of San Francisco Hugh Donohoe. The membership was very active. The school was at its full strength and all his staff were completely religious. The leadership of Father Scahill was very good, very friendly and greatly appreciated by people. Archbishop Mitty Archbishop appointed him and made him Dean of Alameda County. The Diocese of Oakland was born in these days to be exact, on January 13, 1962 and was on 27 February the same year he was installed its first Bishop Floyd l. Begin and was installed as vicar Monsignor Nicholas Connolly. On May 6, 1962, was a very sad day in the history of St. Jarlath. That day was preparing an event in the parish of St. Leo the Great. It was the inauguration of the Parish Hall, with the assistance of the New Bishop Floyd l. Begin who shared with the clergy and guests, when someone whispered in his ear that Monsignor Scahill had died while he was resting from his labors of the day Sunday. It was bitter news to the bishop, the clergy there present, and of course, for the entire community of St. Jarlath who so loved his Pastor for everything he did in so little time. He was the Pastor of St. Bernard who served as pastor at St. Jarlath, Father Dennis Kelly. A man of calm temperament native of Tipperary Ireland (the tradition continues) he kept the school and parish with great efficiency and finalize debt finished end of construction of the parish and when he retired in December 1970 left a capital of $ 390,000.00 dollars in the case of the Parish. Father Kelly returned to his native Tipperary in Ireland where he died on January 7, 1975. Father John P. Connolly San Francisco native, grew up in Oakland, studied at the Colegio de San Jose in Mountain View and attended St. Patrick Seminary in Menlo Park, then was sent to the North American College in Rome where he studied and was ordained to the priesthood by Bishop Ralph Hayes in Rome in December 1938. The P. Connolly returned to the United States and was appointed associate pastor of the parish of St. Joseph in the city of Berkeley, shortly after he got his doctorate in canon law at the University of the Americas. The P. Connolly served in the Marriage Tribunal in the Archdiocese of San Francisco from 1943-1957. In 1957 he was appointed parish priest of San Antonio where he served for fourteen years until 1970. In the interim, is erected the Diocese of Oakland in 1962 and Fr Connolly was appointed Head of Canon Law and Finance Vicar of the new Diocese. That same year he was appointed Monsignior. During the first session of Vatican II was an "expert" Theological Consultant. In 1964, he was appointed Vicar General of the Diocese of Oakland and in 1970 New Pastor of St. Jarlath where he served for 21 years until his death after a heart attack on July 11, 1991. Father EJ Mark Nolting, a native of the city of Hayward, who learned his first letters in the school of St. Joachim and was in the College of St. Joseph in Mountain View where he prepared to begin their studies historian at the University of San Diego . Later he graduated in theology at the Pontifical University in Rome. Nolting Father completed his studies at the Institute Vatican II in the city of Menlo Park. He was Chaplain of Kaiser Permanente Hospital Oakland and Alta Bates in Berekley. In 1978, Bishop John Cummins ordained priest and was appointed vicar of the parish of St. Jarlath. He was also vicar of the Parish of the Good Shepherd in Pittsburg and the Holy Spirit Parish in Fremont. After the death of Monsignior John Connolly, Fr Nolting, was named pastor of St. Jarlath in 1991 and exercised his priestly ministry until the day of his death at the age of forty-two, on January 25, 1994. In 1994 he became the new pastor of St. Jarlath. A man of proven character: Father Raymond G. Breton. Among the many benefits that made the P. Breton for St. Jarlath is no doubt that he has opened the parish to the Hispanic community. It was an easy transition to perform. With great wisdom and based on demographic changes, the P. Breton led a serious survey of the parishioners of St. Jarlath, where he explained the reasons why the Church in its universality is called to serve all peoples of the earth and include everyone. Thus, in 1995, Fr Breton welcomed the Hispanic community by setting the Sunday Mass in Spanish at 10:30. Thank you very much P. Breton Hispanic community will always remember him with great affection and gratitude. The P. Breton concluded his ministry as Pastor of St. Jarlath in 1998. The parish received its first parish priest of Mexican origin in 1998, Father Salvador Macias, who served as pastor until 2004. He was succeeded as parish administrator, Fr Jan Rudzewicz, from 2004 to 2005 and Father Stanislaw Zak from 2005 to 2006. Father Francisco Figueroa Esquer was named parochial administrator on May 1, 2006, a position he has held to date. During his administration the church has faced several challenges as well as the school of St. Jarlath. However, during the administration of Father Francis, the parish has seen countless changes in their environment such as inside. The great work of anti-seismic strengthening and renovation of the roof to prevent water seepage during the rainy season were made. The bells came to life, the pipe organ was completely restored, the sidewalk or street from the rectory and the corner of Fruitvale, with the support of OCO was thoroughly renovated. With the support of many activities of the Hispanic community, they built the plaza dedicated to Our Lady of Guadalupe under the title of Our Lady of the Americas (Which was consecrated by Bishop Cordileone to mark the centenary of our Parish). The boardroom and parish offices have been remodeled and the chapel of St. Jarlath, in the former convent of St. Jarlath. The gardens surrounding the parish have been embellished as never before in the history of St. Jarlath. In the Interior of the parish was restored most beautiful confessional church which overlooks the Rose Garden, The Baldacchino, the chandeliers and lanterns-Florentine Baroque style as well as all the ironwork of the Interior the Church have been renovated and embellished. This would not have been possible without the generosity of the parishioners of St. Jarlath and countless volunteers who with love and dedication have worked hard in these transformations. God save our parish community and its future to meet the challenges of the third millennium. St. Jarlath, Pray for us, AMEN!